Are you stuck in the revolving cycle of continual club buying because you are not getting what you really need! If you are set on buying new “name-brand” clubs – and you’re not thoroughly knowledgeable about clubs in general – what can you do? Call: Better Golf Shot! While the big retailers may have trained staff members to assist you, the knowledge base of those people is usually very limited. As for the franchise fitting centers, their knowledgeable staff always try and steer customers into certain brands or brand component combinations in order to receive a “spiff sale”. Spiff = the practice of paying a small, immediate bonus for a sale to a salesperson. It’s a way to encourage a salesperson to push one product more often than a non-SPIFF paid product. It’s usually paid to the employee by the manufacturer whose products are recommended, or by their employer. At Better Golf Shot, you can benefit from our extensive technical club expertise to help out for a reasonable fee. A club technician is not a salesman. A club technician is an expert at the technical characteristics and performance of golf clubs. That expertise includes any and all brands. This equates to a totally unbiased opinion with zero incentive to have you purchase any one manufacturer’s offering. We will interview you and check out your swing at a driving range. Then we’ll make recommendations to greatly narrow down your choices when you go to a retailer to buy. 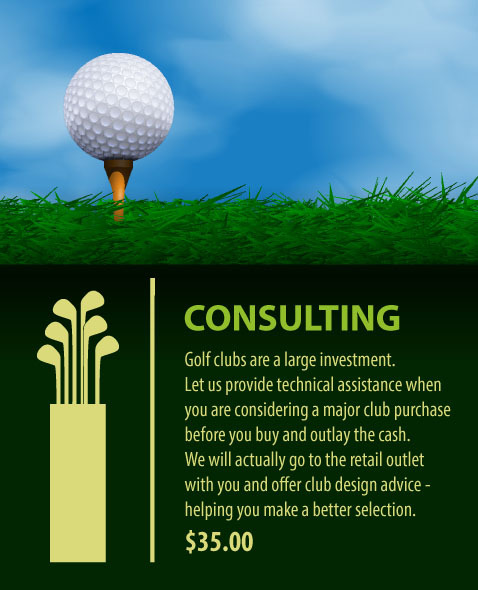 At Better Golf Shot, we also offer consultation services directly at retail locations for a reasonable fee. In other words, we will provide on location technical guidance and advice when buying clubs from retailers. It involves us traveling to the location where you will be buying the clubs (with the exception of online purchases) and reviewing your club choices. We utilize our technical knowledge to assist you in finding and selecting suitable clubs This involves advice on club dynamics and how club design fits into your level of skill and ability as well as physical attributes or limitations. Each manufacturer has their own engineering, ideas, and design patents. While many designs are similar in appearance, no two will feel or play exactly the same way. They all have different nuances which affect club “playability”. Our knowledge of the “gear effect”, center of gravity, and club design enables us to help you make better choices. We use our extensive knowledge of the “playability” factor with different golf club to advise you to choose more wisely. Playability means to evaluate golf clubs on the basis of how easy or difficult they are to play for golfers of different skill levels, with clubs ranging from most-forgiving to least-forgiving. We place clubs into six different categories, ranging from most-forgiving to least-forgiving: Ultra Game Improvement, Super Game Improvement, Game Improvement, Conventional, Classic and Player Classic. Better players will excel with a club from any category; but most golfers will have a better chance of success with clubs from the game-improvement end of the scale. Two hours of our Club Buying Assistance is just $35.00, whether we go directly to the store with you – or prep you with notes and knowledge prior to your making a purchase. At a local retailer or before you make an online purchase of clubs. Get the most out of your investment in the tools of the game. With literally hundreds of choices in the marketplace, get some hard knowledge about your specific needs. Consult with someone who works with clubs every day – 365 days a year.